It is a startling business, realising you are the spitting image of someone else. The Ancient Egyptians would say it was Thoth at his schemes again. One of the more important Egyptian gods, Thoth was amongst many things a settler of disputes, a magician and a scientist. He played a part – in one thread of legend – in coming to the aid of Helen of Troy. And all using a doppelganger, or ‘Ka’, as the Egyptians called them. A great boat was driven by a storm into the mouth of the Nile. In it was Paris and his newly claimed wife, and a lot of treasure garnered from poor old Menelaus, King of Sparta. Paris lied extravagantly to the Pharaoh about how he came by his wife; but others told Seti the truth. Helen had been kidnapped, and pined for her husband and family. Thoth woke Helen up one night soon afterwards and brought forth a double of Helen: a ka, a ghostly likeness. And it was the doppelganger over which all the wars were fought, while Helen hid out in Egypt. Eventually, of course, Menelaus was reunited with his wife. Doppelganger stories abound: like the English tourist who had a yen to see the fictional state of Ruritania. The visitor turned out to be an almost identical likeness to the King. Which was useful, because dastardly Prince Michael, the King’s brother, had the real king kidnapped and drugged the night before the coronation. If the King was not there for the coronation the whole reigning deal was off, and Michael got a shot at the Big Time. And so the British tourist stepped into the breach. The Prisoner of Zenda, by Anthony Hope, is a swashbuckling tale of derringdo and hopeless love, and I have been entertained many a night with the twists and turns of a plot which hinges on a double. Tales of doubles have come to roost far closer to home, this week. We had almost finished strolling round the County Show yesterday when we happened to take a turning into a lane we had not yet explored. Regulations insisted that no dogs be brought by visitors; though stallholders seemed to harbour their fair share. So Macaulay Shrewsday was safely tucked up on his cushion back in Shrewsday Mansions. Why, then, was he looking furtive eating something in a small alcove in one of the tented stalls? Phil did a double take and the whole family reached for their cameras. For never in Macaulay’s seven year lifetime have we ever seen his like. And yet here it sat: his doppelganger. Eating. As usual. We ran the stallholder to ground . What’s his parentage? we gabbled almost incoherently. He’s a she, she said. And her parents were a King Charles spaniel and a miniature Schnauzer. Identical to Macaulay. We showed her a picture of Mac, and deportment and reserve went out of the window. He’s the spitting image, she shouted happily to anyone who would listen. This was Lola. Lola had cost £550. The lady’s friend had bought a similar puppy from the same shop. They never saw any parents. Does yours pack his food away? the lady asked. Does he, we said. He is a consummate food theif. Lola has recently been on a diet and lost manymanymany pounds because of her love of a good bowl of doggie chow. We marvelled. We pinched ourselves. For this soul felt as if she should be coming home with us, she was so familiar. It was all we could do to tear ourselves away from her gentle moustachio’d face and walk away from the scene. Because it felt for all the world as if we were leaving our dog behind. Posted in Macaulay The Dog storiesTagged Ancient Egyptian stories, dogs, doppelganger, doubles, Ka, pets, The Prisoner of Zenda, ThothBookmark the permalink. Someone must be breeding them especially, Jas! A doggleganger indeed. What fun to meet and compare notes. How’s Mac doing with the black wonder these days? So the County Show did turn out to be interesting for you. 🙂 I’d like to think that the photos with the red bits are Lola. My piece of sleuth-giri. What a sweetie-dog. You seem to find stories wherever you go. What a good observer. Lola hasn’t got quite the determined look on her face as Mac nor his quizzical ears, she is a softer version, but then she is a girl. I wonder what they would have thought of each other? How very cool to find Mac’s Ka, I’m sure it brightened your visit to the Fair considerably. I think the pics with red are Lola and master Mac remains his inimitable self. And you would be correct, Lou. Mac is a focused soul. I love the whole idea of doggleganger..brilliant and of course such beautiful subjects to photograph! Separated at birth? 🙂 I am in agreement with others who’ve noted the “softer” look; her ears are fuller, fluffy if you will, and Mac’s face has more buff color, too. But what an unexpected stumble-upon! Made the whole day worth it! It did. It was all we could do to tear ourselves away, Karen. Doggelganger! I love it, and the pictures of these two long lost relations. How fun that must have been to stumble upon Lola. They are just alike, aren’t they? Did you set up a date for them to meet? No: alas, the stall comes from a very long way away form us (in English terms). We were so stunned we didn’t even get the name of the firm! Wonderful that you had a chance to meet Lola! I do think that I see the difference between Mac and Lola . . . but who’s to say. They pepper our stories, Nancy! Similar story: Took my Annie (golden/lab mix) to the dog park one day. Got to talking to woman sitting near me. During the conversation, Annie approached and I reached to pet her. Oops. Wrong collar! The woman’s dog was Annie’s twin, distinguishable only by their collars, and each of us had mistaken reached to pet the wrong dog! Must be littermates. Nope. Different ages, from different parts of the country. But it sure freaked me out. I bet it did. Your dog is such a part of the family, its most disorientating when an identical twin turns up! Do I detect a slight gingery-ness in Mac’s beard, compared to the lady’s? She’s definitely got more salt-and-pepper about her, Pseu, to be sure. She is, Jan 😀 Doe-eyed! Dear Kate, the expressions on Lola’s face are so dear. It’s so clear from this female doppelganer why Macaulay is beloved by your family. Peace. Gorgeous faces and markings on both the doggelgangers. They say we all have a twin somewhere. Years ago, someone said that to me. When I went to see, I couldn’t fathom why they thought there any resemblance. With Macaulay and Lola … there surely is. Loved the story. Thank you, Judy. That dog is a fount of material. Wow, they really are doppelgangers! They would make such a lovely couple. …except that I think, after conversation with Lola’s owner, that they really could be related, Weebles! I think they’d love each other’s company, though. How fantastic! Not-Mac is a bit less expressive about the eyebrows. Softer perhaps? The one with the red lead? Mac’s the pooch with the green leash, but the resemblance is so close. Is Lola Mac’s age, or could they be siblings? Mac is not much of a smiler at the camera. He always strikes me to be a dog on a mission. Lola seemed very ready for her close-up — if I am not mistaking him for her or her for him! You have them taped, Lameadventures. Mac the dog is always rather stern, whilst Lola looked most amenable. Mac being a Shrewsday probably has the superior vocabulary, one that goes way beyond woof, arf and grrrrrrrrrrrr. At first one is completely conflustered, but then it can be noticed that your Mac takes himself far more seriously and has a certain, um, ‘up-yours’ quality lacking in the lady. Have to rename them; Lola as Kate and Mac as Dupli-kate? Ha! Your rapier-sharp wordsmithing strikes again, Col. Touché…yes. Macaulay is abundant in ‘up-yours’. If the French find out about this KA thing they will claim it as their own and write it into their history just like that Jesus related kings thing. If it were not for their ears they’d be identical…they are both so cute! Almost too much cute for one post. I’m amazed at the price, too. But all of my dogs have been freebies. 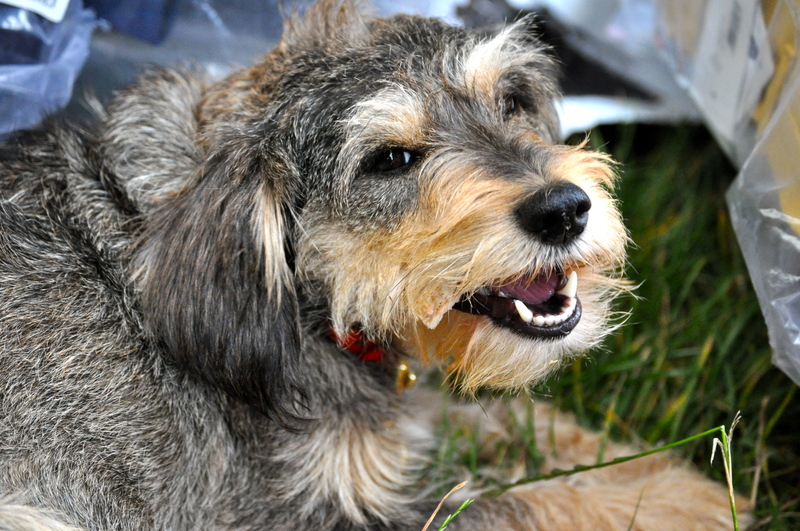 Hi there – only recently found your page and I too have a dog who bears a lot more than a passing resemblance to Mac! Her name is Daisy, she’s cute, highly intelligent and loves her food! We always knew she was a cavalier King Charles spaniel cross but found out by sheer accident a few months ago that she’s crossed with mini schnauzer! And what a wonderful mix this is. With more of the likes of Mac and Daisy around, the world would be a happier place 😊. I read your stories with fascination and would love to know more about his background…..